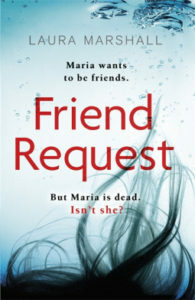 The book begins with Louise receiving the aforementioned friend request on Facebook from Maria Weston, the girl who went missing after their high school leavers party and was presumed drowned. This immediately stirs up bad memories and unease, as there are secrets from the past that Louise has tried hard to bury, living her life trying to become a different person to the one she was at school. Her first thought is that someone has found out what she did, and that she needs to protect her young son, Henry, from any repercussions which might now arise. In a bid to gather more information, Louise contacts old ‘friend’ Sophie, the girl that she was so desperate to be friends with that she willingly followed her around and did anything she asked. In those days Louise only cared about acceptance, meaning that when Maria started school and Sophie didn’t take to her, Louise wasn’t allowed to be friends with her either. This is despite the fact that Maria seemed nice and that Louise enjoyed her company for the short time they did spend together. Instead, Maria was pushed to the social outskirts and made a mockery of, as people began to speculate about what went on at her previous school and why she moved, with the rumours escalating. Sophie is one of the only ones who knows what went on that night, along with Louise’s ex-husband Sam, the father of her son. 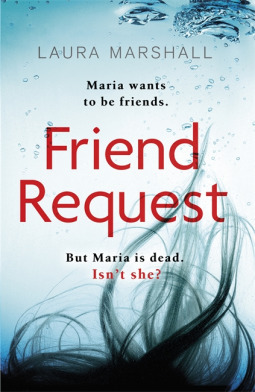 With them all having received an invitation to a high school reunion, Louise is concerned that someone is planning their revenge, or even that Maria herself is sending the messages, as her body was never recovered. As Louise starts to receive further anonymous messages, she believes there is a genuine threat to her and Henry’s safety, and that someone out there is watching her every move. I enjoyed seeing the sinister nature of the Facebook messages develop as the novel went on, as Louise is trying desperately to unpick the past and work out who could be behind it. As such, the flashbacks between past and present are very well integrated, seeming to perfectly complement each other at given plot points. Just as she unravels in the present, Louise’s teenage self is swept up in the group and pushed to the limits, with both past and present climaxes reaching their peak simultaneously. This worked well in creating tension, but at the same time I was keen to know what had happened all those years ago and grew a little tired of the constant allusions to ‘what we did’. Despite this, I found that I could empathise with Louise in the past, as all she wanted was to fit in and get through high school, having naively thought that Sophie and her popular gang was the way to do it. She was reluctant to hurt Maria, but she still went along with it and has been paying for it everyday since, having felt unable to truly open up to anyone about her teenage life. It was only in her marriage to Sam that she felt like someone understood her, having met by chance after leaving school and finding a spark between them. He knew what happened that night and she has never had to hide from him, making the divorce that much harder for her to bear. Things between them now are awkward at best, with Louise handing Henry over on the doorstep when it is Sam’s weekend to look after him. She is reluctant to tell him about the threats she has received as she doesn’t want to let him back into her life, and knows that she could easily be tempted to let him get too close. It therefore becomes hard to know what to make of Sam, as Louise’s own feelings towards him are conflicted, only confiding in him when she thinks Henry might be at risk. She is fiercely protective of her son, which is admirable, but also too caught up in herself and obsessed with justifying her past actions. However, on the whole, I did really enjoy the plot of this book and thought it made good use of modern technology in addressing issues from the past. It showed just how significant the past can be in shaping the future, and how you can never escape from your misdeeds. I might have had my small problems with Louise’s constant need for absolution and comfort, but her character undergoes emotional turmoil throughout and comes to show that she has grown a backbone since high school, finding the strength she wished she’d had then. In terms of how the book ends, I was a little disappointed at the conclusion, as I’ve read several thrillers with very similar twists recently. This is not to say that the ending is predictable, but that I was hoping for something a little different. Regardless, I would still recommend this book for your TBR pile. An intriguing mystery that merges past and present, this book demonstrates how the choices you make at high school can shape your entire future, with the secrets you keep just waiting to emerge. The sinister use of Facebook was well written, and works well as a tool to connect the two time periods, with Louise feeling like she is being followed by a ghost. The depiction of high school life was suitably realistic and shows just how easily a youthful mistake can get out of hand, with the consequences becoming deadly.